BOTH ARE MALES AND VERY VERY VERY VERY TINY CHIHUAHUA PUPPIES, THE SMALLEST WE HAVE EVER BRED AND THE SMALLEST WE HAVE EVER SEEN! EVEN IN PERSON, YOU WILL NOT BELIEVE THAT THERE IS EVEN A DOG THIS SIZE! NOW ALMOST 8 WEEKS AND A WHOOPING 8 OUNCES! FULL OF LOVE AND KISSES! YOU WILL BE AMAZED WHEN YOU SEE THESE PUPS IN PERSON. TAILS GO CRAZY WHEN THEY SEE OTHER DOGS OR PEOPLE. THEY ARE ABSOLUTELY PERFECT DOLLS! WITH THE MOST PERFECT PERSONALITIES! WE WANT RESPONSIBLE OWNERS THAT DO NOT HAVE CHILDREN UNDER THE AGE OF 8 YEARS OLD. DUE TO THEIR SIZES I WILL NOT SHIP THEM, BUT YOU ARE MORE THAN WELCOME TO COME TO MY HOME TO SEE WHERE THEY EAT, SLEEP AND PLAY. THESE GUYS ARE A PART OF OUR FAMILY AND WE SPOIL THEM ROTTEN. PUPS WILL GO HOME WITH FIRST SET OF SHOTS, DEWORMED UP TO DATE, AND A PUPPY PACK WITH FOOD, TOYS, KENNEL, FOOD+WATER BOWLS, ETC SO THEY CAN TRANSITION TO THE NEW HOME QUICKLY AND EASILY. BABIES ARE PEE/POO TRAINED TO GO ON THE PAD. this boy loves to cuddle! 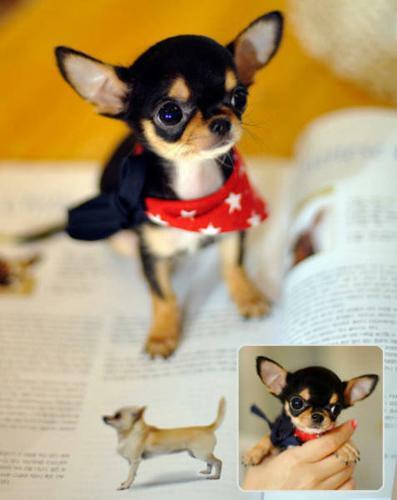 Baby Male Dog - Whippet Chihuahua: "XOLA"